Although many of the points made are helpful, especially for those taking their first steps into social media, I don’t agree with all of them. For example, it’s fine to thank people for retweeting you if you have a small number of followers, but if you run a larger account with thousands of followers you’ll never keep up. One of the accounts I manage has over 69,000 followers – thanking people for every retweet would be impractical. So I decided to put together a few Twitter tips based on my experience, along with a few links to useful resources. It’s useful to start with a plan of subjects you’re going to tweet about. If you blog about barbecue recipes, then schedule a tweet at least once a day linking back to your website to drive traffic. If you also blog about barbecue equipment, then schedule a daily tweet about that too. This ensures that you’re regularly promoting your content and establishing yourself as a barbecue expert. Don’t constantly just tweet links to your own material though as your followers will get bored – if you find interesting articles online then share them with your audience (who you know are already interested in your subject). Follow people with similar interests and retweet links that they’ve shared. As the infographic suggests, it’s good to keep a professional tone to your tweets, but if you follow this too rigidly you can end up sounding robotic and impersonal. The whole point of Twitter is that it’s meant to be social, and it’s a great opportunity to create a persona. Decide what your voice is going to be – friendly, sarcastic, educational – and stick to it. The best Twitter accounts are the ones which have created a distinct identity – @fleetstreetfox is a good example, and so is @innocentdrinks which has an incredible number of followers (182,000 at the time of writing). Ask questions, reply to tweets and have conversations. If you want a conversation you’re having with someone to be visible to all of your followers, then just put a full stop in front of their Twitter handle. Twitter has peak times when your tweets will be seen by a greater number of people. The best time to tweet is 1pm-3pm, so make sure you tweet at that time every day. However, you can still put a bit of thought into what you tweet and when. Think about what your followers will be doing at a given time – they might check Twitter first thing in the morning, during their coffee break, while they eat their lunch, mid afternoon when they stop for a cup of tea, or when they get home from work. Will they be planning their dinner? Will they be thinking about what to cook over the weekend? These are all things to consider. Try not to clutter your tweets with hashtags and mentions. One relevant hashtag is usually enough and if possible try to put it at the end of your tweets, as putting it in the middle of the tweet is distracting. Try not to fill your tweets with excessive mentions too if you can avoid it. 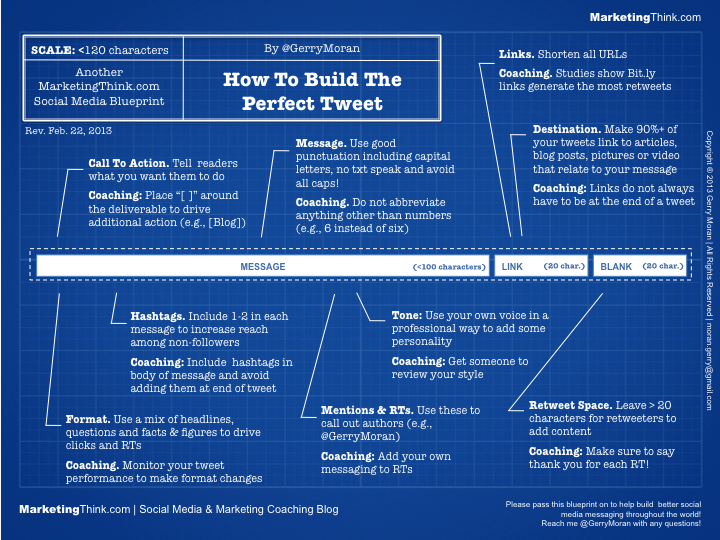 How to get more retweets – A useful article with statistics on how to increase your retweets. International social media guidelines for journalists – An interesting insight into the way different organisations view social media. If a tweet worked once, send it again — and other lessons from The New York Times’ social media desk – This is well worth a read, both educational and entertaining.